Another week in Cyber Republic land means another week of big news and fascinating updates. The Elastos Foundation’s senior members, Rong Chen, Feng Han, and Kevin Zhang, have been very busy recently. Rong just did an interview with SVP Crypto, as well as answered questions from community members in a separate Q&A medium article. Feng Han and Kevin Zhang spoke with representatives of the World Bank and how they will collaborate through the Manhattan Project. It was just announced that Elastos has been invited to the 2019 Asia Pacific Blockchain Financial Summit. More news came out on the status of ELA merged mining. There are now four of the top 10 Bitcoin miners merged mining ELA. BTC.com even announced 100% of its hashpower is into ELA merged mining. Elephant Wallet has a new website and the Hyper.IM dApp just came out for iOS. In this weekly, there’s an interesting article on where the concept of Decentralization came from and how it moved through history. There are additional updates as always in the supernodes list. We also have an ambition-riddled interview with the CR News and Social Media Team Lead, Kenneth K who is seeking to build far more than anyone may imagine with his active team. Lastly, we’ll be sharing another “Moments With KP,” a hit segment in one of our prior Weekly Updates. Oh, and if you’re a developer, KP will be running a new online Developer’s workshop regularly. Moving on to the news. This was a great overall discussion on the state of the internet. Rong eloquently explained how the current internet doesn’t have IDs and are prone to DDoS attacks and data theft. He goes on to discuss how this new Smart Web needs to be a trading economy with fungible assets. One particularly great line was, “Anti-Piracy is the base of the Smart Economy”. Elastos will solve this issue by ensuring that only the owner of data can view and control their data. The person with a DID attached to the customized Virtual Machine will be the only one that can view and trade that asset. Rong also boldly states that no apps, services, or IoT devices should have direct access the Internet. It’s the Elastos Carrier that gives the user entry through the Web, while shielding it from its unsavory attributes. Rong ends with an informative tidbit about digital ownership and resistance to company shutdowns. He poses this question: “If CryptoKitties website gets shut down, can I still run my Kitty?” This is another great problem that Elastos and the CR will solve in terms of ensuring that the user with always have access and be able to run their own digital assets, regardless of if a centralized company goes under. While there are some concerns about scalability and performance, he foresees different technologies for different scenarios to address these potential issues. He mentioned that the CR is an ever-evolving ecosystem where only the strong survive. He hopes there will be more projects funded through the CRC and believes that each will make an impact on their respective markets. Rong also stated that the EF staff will be working on the infrastructure of the Smart Web for the next year and a half in order to properly execute its plans to incorporate Digital Capsule, a SmartWeb equivalent of URL, Personal Cloud Computer (PCC, SmartWeb equivalent of website), and the Native Runtime (native CPU instruction runtime, the ultimate SmartWeb virtual machine for DApps). To all prospective Supernode members, here’s a word from Rong regarding who he will vote for in the upcoming DPoS Elections: “My votes will be cast in the direction of the nodes which prioritize network locale distributions and the diversity of software implementations, e.g., some hosted on Linux, some hosted on Ubuntu subsystem running on Windows, to improve the robustness and efficiency of the Elastos SmartWeb network.” Make sure to diversify your SN setups in order to win over Rong’s vote! Feng Han and Kevin Zhang met with the World Bank for a third time on April 8th. After the meeting, Feng Han shared this with the community: “At World Bank, Zhijun Zhang, lead of security architecture announced his colleagues will form a team with Manhattan Project fund based on the Elastos Modern Internet.” Kevin conducted a two hour meeting with the World Bank representatives going over the current landscape of the internet and the problems Elastos and CR solves. Feng Han also recently spoke on the panel at the Chain Plus Blockchain event. He talked about how the modern internet will influence future payment systems. He also spent time with NEO’s Da Hongfei and Huobi’s North American CEO. Elastos has also just attended the 2019 Asia Pacific Blockchain Financial Summit on April 11th and 12th. This event was in Singapore and attended by more than 100 companies in the blockchain finance industry including 150 head offices, including JP Morgan Chase and GIC. Feng Han participated in a round table discussion about blockchain with several important participants. The conference mainly focused on what the layout looks of traditional financial institutions and how blockchain can be adapted to it. We look forward to getting more details soon. Merged mining has been in the news as of late for the Cyber Republic community. BTC.com just announced that 100% of it’s hashrate is going into ELA Merged Mining. The Elastos network now boasts 31.25% of the Bitcoin networks hashpower that’s led by three of the top ten Bitcoin mining pools in the world. We’ve a few quick updates about the CR ecosystem. The Elephant wallet has come out with their new website. Check it out: https://elephantwallet.app. Hyper.IM has also come out with their iOS release, and you can go to the iOS store to download it. Blockchain project “mainframe” just posted a video that was modeled nearly-identically to one Elastos posted last year. While this is disappointing in the sense of stealing content, the ecosystem sees imitation as the best form of flattery. Finally, the DX Team got a shout out and Elastos Director of the Ecosystem, Song Sijun, wrote an enlightening piece on system dynamics in regards to Blockchain and Elastos. Isaac Newton couldn’t have said truer words. It is the past experiences that help direct future decisions. There are brilliant minds in all fields, and when it comes to the Cyber Republic, the motto is freedom, working together towards a new smart and secure web. There are no borders in this ecosystem; anyone can join and contribute with developer or non-developer talents. Getting to this point of being a collaborative CR community with all the interesting personalities it boasts, is based on historically significant events that have directly instilled the idea of decentralization into today and into the future. If we take the journey back hundreds of years, we can see how the idea of decentralization formed and the direction it’s taken. Learning about these events will give a clearer picture of the direction the CR should take regarding governance and ideals. All revolutions start with ideas. One man’s ideas and passion for Liberty started the conversation of true decentralization. That man’s name is Alexis De Tocqueville. Tocqueville was a renowned French Diplomat, historian, and writer of two books that changed the way of common thinking: “Democracy in America” and “The Old Regime and Revolution”. Tocqueville traveled to America with a colleague in the 1820’s to profile its penal system and how it operated. The goal was to write a book on America’s prison system in efforts to reform the French penal system. The book, “On the Penitentiary System in the United States and its Application in France, (1833)”, was massively successful, leading to the implementation of fair practices in France’s prison systems. Tocqueville then focused on liberty, becoming infatuated with America and the Democracy it represented. He blamed France’s political problems with its centralized government. His words to a friend on ideal decentralization are eerily echoed in today’s world by libertarians and crypto enthusiasts: “Picture to yourself,” he wrote, “a society which comprises all the nations of the world — English, French, German: people differing from one another in language, in beliefs, in opinions; in a word a society possessing no roots, no memories, no prejudices, no routine, no common ideas, no national character, yet with a happiness a hundred times greater than our own…How are they welded into one people? By community of interests. That is the secret!”” These ideals led him to travel to England in order to study its society. He summarized that England was the land of Decentralization. While it had a centralized government, it wasn’t a centralized administration. He noted, “Each county, each borough, each district looks after its own interests. Industry is left to itself…It is not in the nature of things that a central government should be able to supervise all the wants of a great nation. Decentralization is the chief cause of England’s material progress.” His book, “Democracy in America”, shared these decentralized ideals to the world and has be known as one of the most revolutionary publications on the topic of all time. In the 1850’s, Tocqueville wrote the book, “The Old Regime and Revolution”. This piece transcribed the pitfalls of centralized government and how the French Revolution tried to change that. He stated that the objective of the French Revolution was to change both the ancient form of government and the ancient state of society. It’s society and government had turned into a large, central power that absorbed secondary powers, i.e. orders, classes, professions, etc. Unfortunately, at the time, Tocqueville’s work fell out of style, and in the late 1800’s France turned into the fascist, communistic society–the government that he feared the most. Decentralization began to hit the mainstream again in the mid 1900’s. Respectable authors and experienced professionals started writing about the topic, and proof emerged that decentralization had benefits in correct use-cases. Former Rhodes scholar and businessman, E.F. Schumacher, feared the emphasis on quantitative growth rather than a worker’s experience and how productive they were. Ernest Bader, an owner of a family owned Plastics company, came up with a revolutionary idea at the time. He vested ownership of the company to his newly created a John Bader Commonwealth. The workers of the company would help write a constitution setting up basic rules. A semi-decentralized workflow brewed in the John Bader company. While others deemed this practice unwise or foolish, the company reaped the benefits of its strength during tough times, while increasing profits with consistent large bonuses being distributed along with donations. This style of governance helped the business grow and achieve sustainable success. Kohr describes how decentralization leaves less and somewhat equal power distributed amongst other social classes and groups. This leads to better competition, Kohr claims, and best to counteract tyranny in society. He believes that creating a multiple of social systems would minimize group conflicts. No one has too much power and responsibilities and industries are balanced throughout society. In 1982 futurist John Naisbitt came out with the book, “Modern Trends” with the 5th being about taking society from a centralized to decentralized way of life. This book sold over 14 million copies and on the New York Times Best Seller list for two years. Discussions were being had around the dinner table on how we view the structure of our society and what the possibilities were. Code and scripts then also started becoming decentralized. Open source platforms such as Napster and LimeWire in the 1990’s popped up as music and file sharing hubs. This open-source framework become the trend amongst developers globally. In 2009, Bitcoin was famously created by “Satoshi Nakamoto”. This was the first digital currency, using a Proof of Work consensus mechanism done by miners in order to secure transactions for users of the Bitcoin Network. This system was not run by governments, but by code. It’s become the defacto cryptocurrency in the land and is known as a true, decentralized global digital payment system in the world. Through the past 200 years there have been people and products that have made big strides towards decentralization. Where does the Cyber Republic fit in this historical timeline? How will the CR learn from the lessons in its past in order to achieve full decentralization in its ecosystem? A good way to answer these questions is to look at what the CR’s future is and how it will shape the world. It was Tocqueville in the mid 1800’s that preached a society with people from all cultures motivated from each other’s common interests as the ultimate form of a decentralized culture. Here in 2019, the Cyber Republic is made up of people from many countries and continents in pursuit of a new smart web that promotes decentralization and freedom to earn compensation for hard work and meaningful content. This is a trait that would make the French politician proud about the CR. E.F. Schumacher wrote a book called, “Small is Beautiful”, based on his time leading and planning the British Coal Industry and basing his works on the Scott Bader Commonwealth philosophy. E.F. Schumaker made a tough decision to liquidate his company into a Commonwealth and had his workers construct a Constitution regarding the rules of the practices. The Cyber Republic has a constitution explaining its goals and current construct. It’s architecture of being a dual-consensus mechanism of AuxPow and DPoS gives it its ultimate decentralized traits. As elections of the 96 Participant DPoS nodes begins, DPoS will be complete with 108 total nodes, including the 12 CR Nodes. The constitution acts as Schumaker’s Commonwealth that is in place for the betterment of the ecosystem. Bitcoin has become one of the most powerful and secure networks on the Planet. Elastos is merge mining on the Bitcoin Network gives it another form of protection. The CR can exhale in relief, knowing that the protection of the network is taken care of by the DPoS Supernodes and the Bitcoin miners, both. The Cyber Republic and Elastos have the proper infrastructure in place in order to build a fully functional decentralized and fully autonomous ecosystem. There will be 12 democratically elected Council members who will take part in making decisions on which projects get funded, taking into account what direction the community wants to take. There will be no fear of Absolute Power, as Leopold Kohr feared in the 1950’s. It’s inherent decentralized Consensus ensures the step-by-step process needed to be done by multiple parties in order to let a transaction go through the network. Projects like DMA, ioeX, Viewchain, Hyper Connect, and others are looking to pave the way to a decentralized society and marketplace as John Naisbitt foreshadowed it in his best seller. The Cyber Republic is the next leader of the decentralized space. For it is on the shoulders of giants that we will continue to help us CR community members form the most ideal, unified, and protected decentralized society. Our last “Moments with KP” was met with overwhelming positivity, so we’ve decided to do another one. In this edition, KP not only educates in one-on-one interactions, in telegram chats and across various forums, but when a Skycoin supporter chose to compare the two projects, he is quick to educate about the misinformation in the Skycoin supporter’s article. Let’s start with that, shall we? “Elastos isolates itself from the web. If an Elastos developer creates, for example, a web browser, then that browser can only reach content that exists within the Elastos Runtime Environment — it would not be able to visit Facebook or Twitter. Likewise, someone searching on Google will never find Elastos content, because Google can’t see it. We at the CR encourage all comments and discussions, critical or not as long as it’s not purposefully misleading or inappropriate, and though this is not an official Skycoin representative, we hope that this serves as an example of what NOT to do as a community–which is to write something unsubstantiated that attacks another blockchain community, defend it even after it’s been disproven, and filter the presentation to benefit personal agendas. Maybe we can mention something along the lines of how DID could prevent scammers like the ones in our Twitter. That would be untrue. It’s the feature of Carrier that prevents scammers, not DID. Because you can talk to other people only if you’re friends with them on carrier. I should just stop pretending to know anything. Unlike how I’m making him sound, KP actually does spend quite a bit of time answering questions, rather than going out of his way to correct innocent individuals like me. The point we’re making about KP is that he goes out of his way to educate the community, and it’s often a time consuming process. This is why we feel the need to aggregate this amazing content and share his answers to everyone. “We briefly mentioned there are 12 CRC supernodes at all times and that they always act honestly.” How do you know they will always act honestly? “Because the Ethereum sidechain is also DPoS, it can support much higher TPS (Transactions Per Second) than the public Ethereum blockchain.” – Sacrificing (one of the layers of) security for convenience (i.e. scalability)? It means that this ETH is dependent completely on DPOS unlike real ETH, so doesn’t it make it a different token and not the same market value? Or is it that it is not supposed to be pretended to be real ETH but is rather a way to add ETH smart contract methods onto an ELA side chain? If it was considered real ETH, it would be inflating the number of Ether wouldn’t it? So this must not be what is going on. I saw it was called SETH in the explanation. Is there somewhere to read about how sidechain coins compared to their original counterparts? “The 12 CRC supernodes are controlled by the secretariat team of the Cyber Republic, and each CRC supernode is controlled by the private key of each of the 12 council members. So, while there is a possibility that some of the council members could collude, if this is detected in any way, they not only lose their 5000 ELA that they have to stake, but in addition, they likely will be impeached by the community and they’ll lose their reputation since they’re the decision makers of the Cyber Republic. So, yeah, it’s possible but highly unlikely the 12 CRC supernodes will try to do something nefarious because they have a lot more to lose than the regular supernodes. I understand that a supernode that disgraced itself would surely end up being effectively ‘impeached’ and never voted in again. If the CR Council member has to be publicly known, which may not be necessary for supernodes – then I agree that the CR Council Member has more to lose because their public reputation is on the line. However, why does the CR Council Member have to stake only 5000 ELA, the same as a supernode, when they get voting power over proposals? The CRC has more power than a supernode, yet the same staking requirements. Next, the ETH sidechain inherits neither Bitcoin’s PoW security or its low scalability. so there’s still a little bit I don’t understand, SETH are they supposed to be 1:1 value with ETH? “The supernodes that are nefarious get a ban of 7 days, but they still retain their votes so after 7 days, they can rejoin. But since the 12 CRC supernodes are controlled by the private key of the council members, once that council member is impeached, they can never be a council member again which effectively means they can never participate as one of the council members. The 12 CRC supernodes are never voted in via DPOS election process but are rather always controlled by the private keys of the current 12 council members. The CR Council Member has to stake 5000 ELA same as the other supernodes because that’s the amount of ELA needed to stake to register to be a supernode. The council members do have voting power over proposals, but they don’t necessarily have the only power. The community can also reject any of the proposals provided the requirements are met. ETH sidechain does NOT inherit the bitcoins PoW security as it’s only DPoS consensus, so it inherits the DPoS security of the Elastos hybrid consensus. However, remember that if you want a more secure sidechain, you can use NEO sidechain which is PoW and merged mined with BTC. Or, you can submit a proposal on CR to create a second ETH sidechain with PoW consensus. The framework right now is a starting point. It’ll continue to evolve over time as the new needs are gathered and on a need-basis. Do not compare Ethereum sidechain of Elastos with the public Ethereum blockchain because they are two completely separate blockchains and have no relation to one another other than the fact that they can both run smart contracts based on solidity, vyper, etc. The ethereum sidechain is exclusively tied to the Elastos main chain because you first have to transfer some ELA from main chain to Ethereum sidechain in order to create transactions on Ethereum sidechain so all the sidechains are tied to main chain in some respect. In this way, the currency that’s used on Ethereum sidechain is ETH ELA and can only be used on Ethereum sidechain. When you want to transfer this to someone else, it basically transfers to main chain and then to another address that way. As you can see, the currency that’s used in all the sidechains are still secured by bitcoin hashpower one way or another. It’s just that you may be able to spend these ETH ELA on ethereum sidechain at a faster rate than on main chain. There’s a second election for council members? Where is the info about this? “That’s correct. You cannot generate ETH ELA out of thin air nor can you generate any tokens on any other sidechains. They all have to first be transferred from main chain to these sidechains. However, since we know Ethereum can issue ERC20 and ERC721 tokens, you can then spend these ETH ELA to issue your own ERC20 or ERC721 tokens that are not tied to ELA in any way because they’re exclusive on Ethereum sidechain. If I start collecting digital assets for projects build on Elastos using ELA ETH sidechain, or the (ERC721 standard) how will these digital collectables appear in my ELA wallet? I’m curious about the ERC721 standard vs the ELA DID standard for creating digital collectibles. Will ELA use both or turn everything into ELA DID? “Those are some good questions and there are no clear answers at the moment because the concept of digital assets is still in development. Right now, the foundation for digital assets is just going live. The digital assets will come to fruition once the base is solid and built in the next year. One of the future spotlight series will also be about digital capsule, so I don’t want to answer these specific questions about it as things might change between now and then. KP also discusses how supernodes are treated for inactivity. You are an on-duty arbitrator and you don’t submit a block proposal for 48 hours. For this, you are penalized 500 ELA and receive a 7 day ban. You are a regular arbitrator and there are only 24 signatures and you don’t sign a block so it’s not a 2/3rds vote. “DApps will not need to interact with the main blockchain often, and will only be interacting with it when they need to execute some smart contracts which can happen only periodically. All off-chain communication is handled by Elastos Carrier, Elastos Hive, etc, so the dapps are not running on-chain 100% of the time but rather they are run on mobile devices and utilizing other devices like TV boxes, personal cloud storage, other nodes, etc, for actual communication. The Ethereum sidechain is DPoS consensus and the block time is 5 seconds each, so it’s already super fast and should handle a lot of load even if hundreds of smart contracts are deployed to one single Ethereum sidechain. However, a second Ethereum sidechain can be spawned if there’s a need for it in which case there would be one dapp talking to one Ethereum sidechain while another dapp would be talking to another Ethereum sidechain. This works the same way for NEO sidechains too and token sidechains as well. Let’s assume that there are some dapps that are very heavy and do require their own Ethereum sidechain. Let’s also assume that there are around 10 dapps that need their own Ethereum sidechain. This is just an assumption, of course, but in order to require your own dedicated sidechain, your app will need to have an insane traffic because if not, a single Ethereum sidechain can handle lots and lots of dapps already. But, for arbitrators needing to run all these sidechains, one thing to keep in mind is that an arbitrator is just a process. Through the configuration of your arbitrator process, you are basically running one node of each sidechain, one main chain node. So, even if there are 20 sidechains in the future, they don’t all need to be running on the same machine. They can, but they don’t need to. So, in this way, a single supernode may consists of multiple containers, machines, etc that run different nodes for different sidechains. This is a horizontal solution that Elastos employs and I think even if there comes a time when there might be 20 sidechains in the future, it shouldn’t be an issue. Once again, we appreciate all the time KP spends to answer community questions, no matter how small or time consuming they may be. As there are many terms to such a large project like Elastos and the Cyber Republic, we’ve decided to build a growing glossary of terms that can help the less technically acquainted understand better what the tech means and the impact it could have. This week we’re focusing on DDoS attacks. Where usually we try to keep things brief, this week we have an extensive description of DDoS attacks from multiple sources because of just how dang interesting it is. Spoiler alert: Elastos solves most DDoS attacks. “Distributed denial-of-service attacks target websites and online services. The aim is to overwhelm them with more traffic than the server or network can accommodate. The goal is to render the website or service inoperable. “A DDoS attack requires an attacker to gain control of a network of online machines in order to carry out an attack. [An example is when] Computers and other machines (such as IoT devices) are infected with malware, turning each one into a bot (or zombie). The attacker then has remote control over the group of bots, which is called a botnet. There are several types of DDoS attacks: layer 7 DDoS attack, HTTP Flood, Protocol attacks, SYN flood, Volumetric attacks, DNS Amplification, several with fun names such as Smurfs, Teardrops, Pings of Death, and more. There are a few well known DDoS attacks in particular. The 2016 Dyn (a major domain name systems provider (DNS)) attack was accomplished through Mirai malware. Major websites including AirBNB, CNN, Netflix, PayPal, Spotify, Visa, Amazon, the NYTs, Reddit, and Github were all taken down. The Dyn attack was done by creating a botnet of IoT devices, including cameras, smart televisions, printers, and baby monitors. “Cybercriminals have developed a business model that works this way: More sophisticated cybercriminals create botnets and sell or lease them to less sophisticated cybercriminals on the dark web — that part of the Internet where criminals can buy and sell goods such as botnets and stolen credit card numbers anonymously. “The dark web is usually accessed through the Tor browser, which provides an anonymous way to search the Internet. Botnets are leased on the dark web for as little as a couple of hundred dollars. Various dark web sites sell a wide range of illegal goods, services, and stolen data. “DDoS attacks are sometimes done to divert the attention of the target organization. While the target organization focuses on the DDoS attack, the cybercriminal may pursue a primary motivation such as installing malicious software or stealing data. A DDoS attack is basically like getting a phone call, and then the doorbell rings, and the tea kettle goes off, and then the doorbell rings again while the dog goes nuts and you smell burning pizza that was in the oven and your dog is ripping up your couch as he’s barking at the mailman waiting for your signature when your facebook messenger starts pinging you insistently and you just don’t know what to do first, except that it can’t be random that it’s all happening at the same time, can it? When you finally figure out what to do, going to the door, no one is there, and the kettle isn’t even on the stove and you don’t have a dog at all…are you going crazy? But no, the pizza in the oven is definitely burning now. Damn it, there goes your lunch. DDoS attacks are covered in almost every tutorial or discussion about Elastos, but suffice to say that Elastos prevents anyone from getting to your doorbell (or anything else) unless they are verified as real, safe, and someone you want to hear from. They are now recruiting 24 node candidates (up to 30 in the case of a large applicant pool, down from the original 36) and voters. ELAlliance is not an exclusive alliance, meaning that node candidates of ELAlliance can also be members of other alliances as long as they comply with the rules set by ELAlliance. The reason for the reduction of the number of node candidates is that it allows voters to vote for 12 candidates outside the Alliance while casting all 24 votes to those inside the Alliance to enjoy the greatest rewards. They hope to be flexible for both candidates and voters to join the ELAlliance whose aims are to benefit ELA holders who cannot obtain reward directly from the DPoS elections and prevent the potential dominance of whales. Currently there are 22 node candidates filled, and community members are invited to apply. They have recently released their website (in Chinese) and will have the English version very soon. A number of supernode candidates have come together to form International Decentralized Elastos Alliance. Due to concerns about over-centralization, they hope to be a clear example of full decentralization. At the moment, the countries represented are: Scandinavia (Elastos Scandinavia), Switzerland (Elate.CH), France (Orion), Russia (Northern Lights), Thailand (Thai ElaDev), China (Tyro Lee), US (Houston and Starfish), Italy (Vitruvian Node), Austria-US-Morocco-New Zealand-England-Germany-Belgium (Enter Elastos Node, Hyper), and France-US-Canada (Wild Strawberries Node). This Alliance believes that the perfect DPoS network is when there is distribution of nodes in at least five continents and twenty countries, which they will try to guarantee as an alliance. Any node that is against centralization is welcome to join. Sunny, aside from his work in Elastos, is the Founder of MIT IDE Blockchain Pillar Foundation, an Instructor at Tsinghua University’s iCenter, Secretary General of Asian Blockchain DACA (Distributed Autonomous Coalition of Asia), Leading Editor of the books, “Blockchain, Blueprint of a New Economy”, “Blockchain Development and Examples”, “Blockchain: Quantum Wealth”, etc. He’s also the Course Designer of Tsinghua University’s graduate course series, “Cyber Intelligence Economics and Blockchain”. The DHG Super Node has just announced its participation in the DPoS elections. The person in charge of the DHG Super Node is Dahuang Ge. He is a private investor in the early days of the company. The DHG node “dares to do, and stick to the same personality.” It’s election manifesto is, “Building a Community and Building Insight”. RUOLON Node is comprised of three members with similar interests in the Elastos Ecosystem. A statement from the team: “The RUOLAN node will, as always, closely follow the Elastos project to realize a safe, credible, and decentralized Internet dream. A generation of Internet people will continue to face the dream of success!” RUOLON Node has also announced a new Supernode Alliance that proposes a “cross-reciprocal investment solution” for voters and nodes. Shijui TV has recently announced their campaign to run a Supernode, joining other ecosystem partners such as Viewchain, ioeX, Hyper, DMA and more. ElastosNodes.com is led by David Schwartz, a full stack engineer at Nash Exchange and City of Zion contributor. David has degrees from UC Berkeley and Columbia University and is a big fan of Elastos! While David’s work is at Nash, the management of the nodes is not related to Nash in any professional capacity. ElastosNodes.com’s first initiative in the Elastos ecosystem will be to host up to 5 supernodes. While the initial goal of ElastosNodes.com is supporting the signing of blocks packaged by miners, down the line, they will be evaluating other opportunities to support and develop the Elastos ecosystem. ViewChain announced its participation in the Elastos DPoS Node Election. ViewChain is one of the world’s largest decentralized storage networks with nearly 600 million users worldwide. Its management team highly recognizes the unique concept of the future development of the next generation Internet by Elastos, as well as its ability in R&D of peer-to-peer distributed trusted Internet operating system. Therefore, ViewChain became one of the first ecological partners of Elastos at the beginning of 2018. By the end of 2018, ViewChain began to implement ELA commercialization for its own users in Myanmar. Users can obtain ELA by completing various tasks in the digital wallet, and can also use the acquired ELA to participate in the lottery and get mobile phone airtime. 150,000 users received ELA within a month. In March 2019, the mobile game with the built-in ELA wallet has also been available. Users can exchange the ELA in the wallet for the game currency, leading to faster growth of the user base. At present, there are already accumulated 500,000 Myanmar mobile phone users who have registered ELA wallets and own ELA. The daily active ELA transactions have exceeded 15,000. ViewChain plans to introduce ELA as a user incentive and payment method in more Internet applications in addition to lottery, win-loss, and mobile games, and they will help Elastos to jointly build the next generation Internet. Details on their Supernode rewards and setup are yet to be released. “We are two brothers who fell in love with the vision of Rong Chen. We discovered Elastos with the first video of Blockchain Brad and we never quit following the project since then. 1. When we were young, we used to live on a boat with our family. The boat was named “Orion”. 2. Orion is a prominent constellation located on the Celestial Equator and visible throughout the world. This symbolizes our vision of decentralization. 3. Orion in mythology is a hunter who can defeat anything. This is our vision of a ELA Supernode that’s here to protect. We will use a French cloud called OVH. We plan to stay in France in order to be the most decentralized solution we can offer for the time being. We do not look for enormous profit and we are attached to the idea of rewarding the community and participating in the ecosystem in a sustainable way. Therefore we are part of the International Decentralized Elastos Alliance (IDEA). The Starfish Supernode is a group of 5 members from the U.S. and the U.K. who support the vision of Elastos and are eager to be a cog in the upcoming smart web. Our pool members have backgrounds in information technology, engineering, product innovation and management, system administration, and digital forensics. Over time, we hope to mature into a trusted entity within the Elastos ecosystem. Our name stems from the fact that starfish operate without a brain or central point of control. Each limb of these headless creatures acts independently, but cooperatively, in the best interest of the organism as a whole. Many species of starfish are even able to sustain immense damage, such as the loss of multiple limbs or bisection, but due to their distributed and redundant systems the starfish cannot only survive, but fully regenerate. Nature discovered the advantages of distributed systems long ago, and now technology is emulating nature. In a similar fashion, we believe Elastos will not only endure, but proliferate as a growing number of selfless individuals such as yourselves join the project’s ranks. Our slogan, “Strength in distribution”, encapsulates all we stand for. Accordingly, the members of the pool have agreed to limit our organization to a single supernode in an effort to spread the network consensus duties amongst as many independent parties as possible. The team plans to run a 2 to 3 server configuration on a major cloud provider (AWS, Azure, Vultr, etc.) with a migration plan in place in the event of extraordinary circumstances such as corporate or government censorship. We intend to provide percentage-based voter incentives competitive with the market rate and to encourage voter loyalty with a gamified reward system intended to keep voters actively involved in the community. In the early stages, any leftover profits awarded to us will be used to pay operational expenses and reinvested into future projects that we have planned to support the Elastos ecosystem and the Cyber Republic. The goal is to make the Starfish organization more than just a supernode pool. We hope to be able to market ourselves through these projects in addition to our website and social media outlets. Their ICOPC community channel has more than 500 private members with high profiles, most of which are CR and Elastos supporters. Alliance Block will be hosting their Supernode via AWS Cloud. The team is composed of four people, three of which have experience working at companies such as Barclays, JP Morgan, and PostNP. You can reach the team at supernode@elastosdma.org. Houston Supernode has created this infographic on Elastos. Shijun Song, Elastos Ecosystem Director, shared with the community of HashFuture. Mr. Song spoke on the significance of having Elephant wallet in the Elastos ecosystem. Elephant wallet embeds Elastos DID in it and helps users to organise their DIDs. Elephant users can transfer data and assets in different applications with the use of DID. These assets are not only tokens, but also electronic books, music, videos as well as personal privacy and consumer data. Different applications include TV boxes, overseas apps, and apps by HashFuture. Elephant is developing businesses in e-commerce and insurance, and users could get free insurance by clicking on the insurance page; it has already hit its max cap, and it demonstrates the utility of the elephant wallet. Elephant wallet will cooperate with HashFuture and will include its products in the Explore page. Could you introduce yourself and your background? What do you for a living? I have a pretty diverse background. Most relevant to the CR, I’m a professional writer and photographer/videographer. I have several other professions such as being a doctor, and I am a touring movement instructor in dance, with a history of acrobatics, parkour, and martial arts. I’ve won awards, recognition, or competitions in all my professions. I suppose that at this point, being the team lead of the News and Social Media team is yet another career I’ve undertaken–though no awards thus far. How did you learn about Elastos and how did you get connected to the Elastos team? What made you so eager to join Cyber Republic ecosystem? I’ve been involved in blockchain since 2016, and I’ve been a long-time fan of NEO/antshares. Elastos was announced as being connected with NEO, so of course I had to research it. Like NEO, the scope of Elastos was large and intricate, but since I was already a fan of blockchain paired with IoT, digital assets, platform projects, I found Elastos to be irresistible. Anyway, I have a hard time standing by and watching something I am passionate about develop without my involvement. I’ve always been on the cutting edge, and the Cyber Republic was actually an idea I already had developed in a novel I wrote–the idea of a decentralized government was built into the entire book. When Rong announced the Cyber Republic, I totally felt like he “stole” my idea. You are the team leader for CR News and Social Media team. Could you tell us a little more about your team structure and its members and how it’s grown? In short time we recruited more writers and researchers and community leaders onto our team, but the amount of work continued to grow. I’m aggressive in everything I pursue, so I suppose it’s no surprise that my vision grew faster than our team (or funding) did. But I can’t help doing everything to the best of my ability, regardless of time or pay, and I should’ve known that about myself before I started. But even with high quality content, we quickly realized that content needs exposure, and so we created a Social Media subdivision to spread the word. At this point, I’m basically doing CR News and Social Media work full time, and we have another 3-4 people working just as much as I am. In just a few months we’ve expanded to a team of arguably twenty people. I’m incredibly proud of what we’ve accomplished so far. 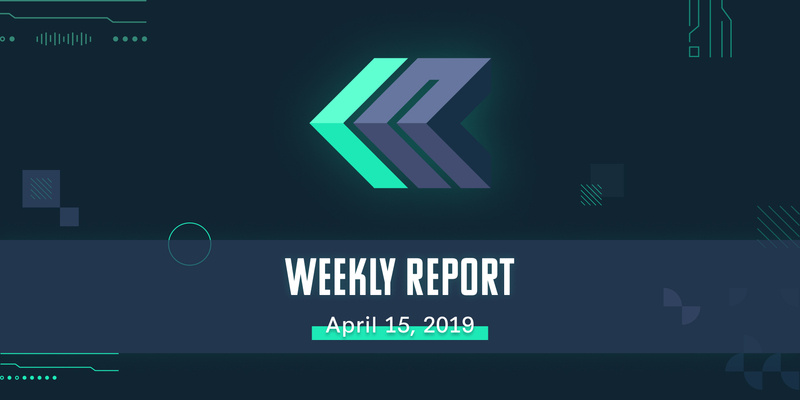 CR weekly report has been issued weekly without disruption for the past few months since December of last year. That’s an amazing progress even though the team is new and CR is still in its alpha version. What changes do you foresee in roles and values of this team will bring to the community with the official launch of CR in August later this year? I want to do more. With my background, I know the value of presentation, of education, and of aggressive presence in any industry. The world is for the taking, and there are only a few people with the drive to actually take it. The CR is no different. With a strong community, we can create whatever we dream of. For my team’s future? I want a marketing team, not just a social media team, and I also want a media team because I have a professional background in media and I know it’s value–I know the direct consumer association of quality images with quality product. I want a team of artists and ambassadors. I want a team of educators and content creators. I want a web presence that deserves the name of “news” in which we become a crypto resource for all crypto enthusiasts, as well as the mainstream. There should be no doubt that I also want a sustainable model of income for this team so that while the team drives up the value of Elastos in the public’s eye, we also have a sustainable model of business in the “real-world”. We have thoughts on ad revenue, store integration, paid features, sponsorships, and even getting a press team supernode to generate funding for our team. I could go on and on, from devote designers and graphic artists, analytics and data accumulators, to podcasters, motion animators, even comic artists, but essentially I believe that our team could be unstoppable in the era of the new internet, and I want to take our team to the very forefront of public influence. When the full CR launches in August, we will be there, and we hope that the community can see how much value we’ve already contributed so that we can create every CR member’s wildest dreams of Elastos awareness, adoption, and impact. Time, and manpower. The vision I have. To accomplish these visions, I need help; I need individuals with skills. But for me to acquire those skills, I need to pay them, and thus, I need funding. It’s a never-ending struggle of proving what we are capable of, and then seeking the funding to continue offering the impactful products we’ve already been offering. That being said, I believe that when people are in need, there is efficiency, and when there is “plenty”, people are wasteful. It is because of this belief that I want to always be in need of more. I want to need more time, more funding, more manpower because when anyone has too much, it means that the person simply doesn’t have a vision of where to go next or what they can already do. There is no limit to growth, so my biggest challenge is the ever-present question of, “How do I make dreams come true without enough of __x__, and how do I get more of __x__?” And momentum is important. If you aren’t moving forward, you’re moving backwards, and the momentum you’ve generated in the past will make the future progress that much faster. Eventually, I believe the challenge will expand into something not so much about doing more things, or gaining more attention, but how to do things ethically. I have no doubt our influence will grow, and with that, the responsibility we carry will grow as well. You are very active in the CR forum – creating important topics that are worth engaging in, such as proposing React Native team funding, seeking candidates profile for DPoS election, as well as researching other crypto projects that are potentially becoming a sidechain of Elastos blockchain. What are you trying to achieve with these initiatives and how they are going to impact the community in a positive way? I honestly wouldn’t consider myself very active in the forums and chat groups. This is because I spend my time organizing, delegating, and planning. The goal of my forum and chat engagements are usually focused–just planting a seed that I hope will grow. I try to offer ideas and the initial push for things that other people can step up and accomplish, but with my level of commitment to other areas of life, and to the CR News and Social Media team, there’s little time left to simple engage frequently. Less is more, and impact is not dependent on quantity. In your opinion, if you were to rate using a scale of 1 to 10 (where 1=low and 10 = high) to describe the level of satisfaction of your current team performance, what would it be and why? Any further major changes / improvements / achievements that you would like to see from your team in the next 12 months? I am extremely pleased with my team. I couldn’t have asked for a more committed group. 9 out of 10 because there’s always a higher level possible. I only regret that I can’t pay the team members everything they are worth, and I can’t bring on other eager members with our limited resources yet. But I believe that with more accomplishment, more “proof of work” you might say, we will gain community attention and support. We are the eyes of the Cyber Republic right now, but we want to become its voice, speaking to the rest of the world. We will be the most powerful voice we can be, capable of changing the very direction of the new internet. In twelve months I imagine us becoming an industry resource with a similar type of effect as coinmarketcap. Right now, coinmarketcap is the leading referrer to the Elastos website. In turn, Elastos is the main referrer to the Cyber Republic. Our goal is to create a news website specifically for the Cyber Republic but also for crypto and technology in general that acts as a major gateway directly to the Cyber Republic (and to Elastos). When August rolls around and the full CR is launched, we want to be established as the most influential grass-roots community organization of the CR. We will be asking for a lot of trust at this point, but by then the community will know well who we are and what we are capable of, and we are betting that our impact will benefit the entire ecosystem to such an extent that we become unquestionably one of the most important cogs in the ecosystem. Finally, what is a fun fact about yourself that we’d never guess just by looking at you? Oh, there’s too much ridiculousness that I could mention–but as a constantly touring pole dancer, I have around 20,000 followers at this point, which is not really a lot (or little, either), but it’s enough to sustain me traveling to just about any country I want to visit and also get paid for it, which is one of the coolest things I never thought I’d be able to say. Elastos Hive Cluster: a decentralized File Storage Service that based on IPFS cluster. Elastos Sidechain: a scaling solution that utilizes parallel blockchains to the main chain in order decrease transaction congestion on the main chain. DPoS: Delegate Proof of Stake is a method of finding blockchain consensus in which specific machines (delegates) are trusted with the power to verify transactions. These delegates are voted in by the community. Elastos DID: An Elastos sidechain that can be integrated with any other sidechain on Elastos. Its function is to provide a unique identity to a user and to store that user’s data in a secure, decentralized, and provable way. Merged Mining: Mining two blockchains at the same time without any additional resource consumption. This allows a smaller blockchain to “piggyback” the power of a larger chain and leverage the security of its hash power. In Elastos’ case, the larger chain is Bitcoin. DDoS Attack: Distributed Denial of Service–An attack that makes an online service dysfunctional by overwhelming it with traffic from multiple sources.